No one should have to work sick, or choose between staying home with a sick child and losing pay. Yet 2 in 5 workers in Tacoma have no paid sick leave, including thousands who work in grocery stores, restaurants, and medical centers. 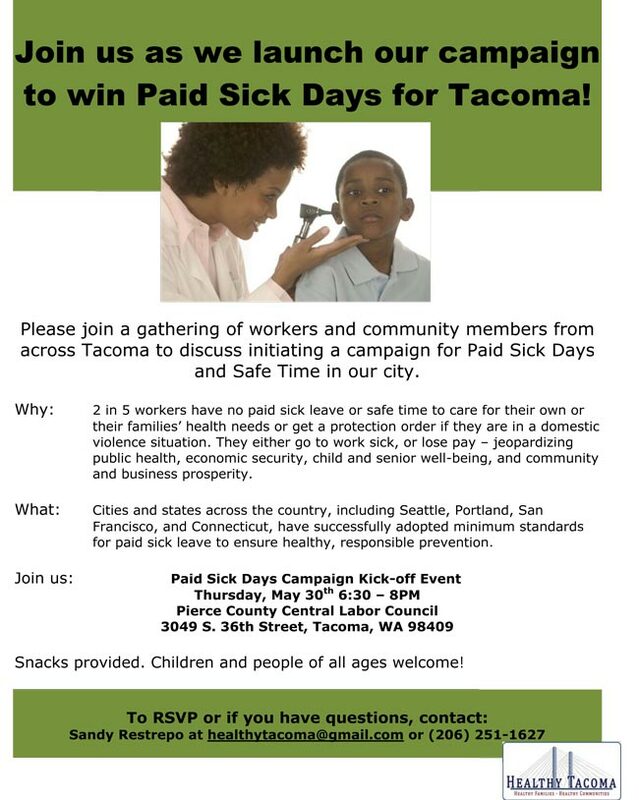 Join us to kick off the Paid Sick Days for Tacoma campaign, and help ensure we have healthier families, safer food, and more productive workplaces! Seattle, Portland, San Francisco, New York City, and Connecticut, have all passed paid sick leave standards to ensure healthy, responsible prevention. It’s time all workers in Tacoma got the right to stay home when sick, without worrying about losing pay – or even their job.